(Farthest to nearest) Hanna, Tanya, and Cristina perform some of the more glamorous work of this trip- cracking oysters apart and finding spat (oyster babies). David needed everyone on his team to perform, or this week would be wasted. A while back, I was talking to Randall or David, I forget which one, and they were telling me about building a research crew. Obviously you need people who have the knowledge and skills to do what needs to be done- from identifying fish to driving a boat, or setting a gill net. But just as important, they said, was that you had people you could get along with, since you practically live with them sometimes. Weeks like this one are where building the team pays off. When you’re getting bitten up by gnats on an oyster reef at 6:45 in the morning, you don’t want a crew member sniping at another about losing a fish out of the gill net. David remarked to me that the morale of this team had stayed strong, despite the schedule always changing and everyone having to shoulder more of the load while David got the tiles ready. They did a lot of work on their own, and made it possible to get everything done even as plans shifted. On a day like today, it was good that David has the crew he has. 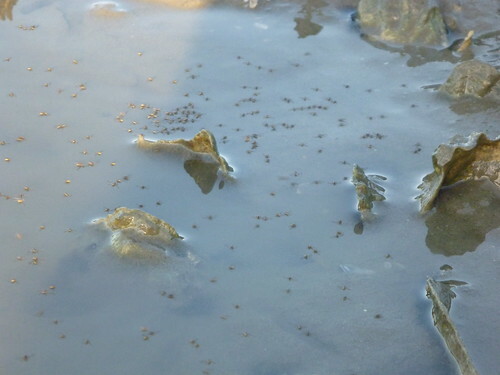 A swarm of gnats hovers over the oyster reef water. 6:45 AM– Retrieved fish from nets, deployed traps. 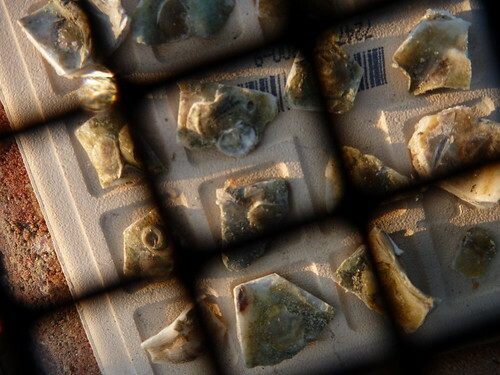 After a night of battling cockroaches in their “haunted” house, they might have been happier to be out on oyster reefs at this early hour. They might have, had it not been for the no see-ums. They were getting eaten alive, which made it hard to work. And it got worse from there, as if the universe decided to pile it on in this last day. As early as it was, the birds had gotten to their fish before they did and there were no stomachs to examine. And then there were the injuries. David cut his finger on a catfish spine, and then, within about ten minutes, a stone crab got a hold of Hanna’s finger and inflicted some pain. They’re both okay. 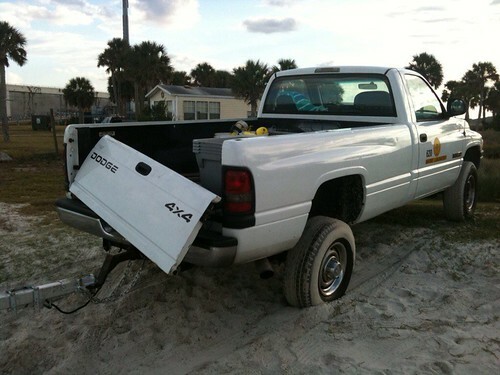 Their truck, however, is a little worse off. Banged up over the course of the week, the crew- and their truck- are ready to come home. When they got back, they glued spat onto tiles one more time to deploy this afternoon. 3:00 PM– Tanya, Hanna, and Cristina retrieved the traps and set the tiles. 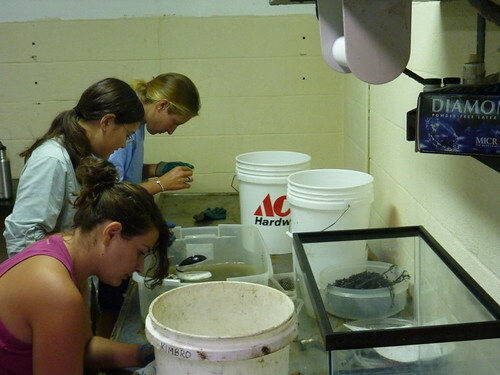 7:00 PM– The girls headed back to the FSU Coastal & Marine Lab. When they got there, they cleaned all of their gear, even though it was late. They figured that it was better to wash the salt off sooner than later. So that was the week. They’ll go back to each of the sites about every six weeks, though it won’t always be this intensive. David, Jeb (SC/ GA), and Jon (NC) will start to see seasonal patterns in the fish that they find- when do certain fish tend to show up on what reef? They’ll check in on their tiles and take photos, and over the months the photos should play like a flip book in showing the growth of the oysters on each site. They’ll gain understanding, and they’ll run into more road blocks. They have about two-and-a-half years left on this study, so while Thursday was the last day of the push, they’re nowhere near the end of the road. Assuming no one tampers with them, we should be able to watch these oysters grow up over the next year. Check back in a couple of weeks for wrap-up posts from David and Tanya. David’s research is funded by the National Science Foundation.